Got up this morning. Nice day. Torrential rain yesterday, Torr Ential. 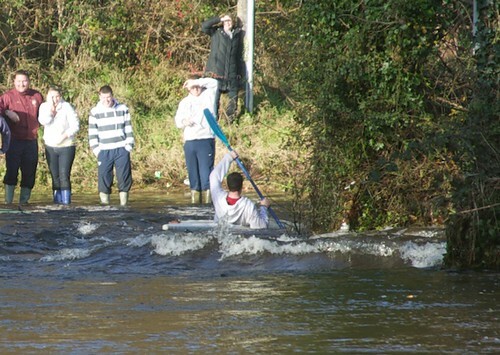 Hear that Cork is badly flooded. I'm retired. I can do what I want to. I'm going to cycle into town to see the floods. I live 2.7 miles from the centre of Cork. I cycle in by a route which I know will not be flooded. I come across a flooded road just where we saved the woman from drowning last week. I'm looking at this when a young man canoes down the road and heads around the corner!! Must be English, but he's not. The English love eccentricity! Saw lots more of interest, but this alone was worth it!! Then retraced my steps and saw several other flooded roads, saw a road being swept away near a bridge, torrential flood. Saw a flood on another country road with young men coming flying out of a field and taking the corner on the road, at high speed, in kayaks!! Never got the chance to do that. No kayaks in my time. This ride was only about 20 miles, but it was fun from start to finish, though there was so much flood-damage, that it was far from fun for the poor affected people. This was a really bad flood, like that which affected Gloucester a couple of years ago, and it's far from over, to judge from the weather forecasts. Posted by Garry on November 20th, 2009. The Upper Picture was published in today's Irish Examiner. I'd emailed it in. It's a good photo. Is it on their website? 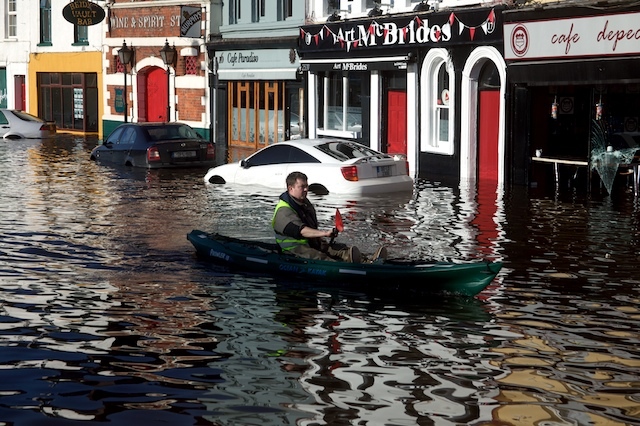 Cork seems to have been badly hit: 123,000 people will be without water for at least three days (according to the Irish Examiner). Incidentally, someone searched Irish Google for "st patrick's hill cork gradient" and found your 'Nasty hills' page.